Welcome to our Microwaves101's Download Area! If you have something useful that we can add, send it along to us. We'll trade you a free gift! Under this category we plan to expand and offer example files in environments such as Keysight ADS, AWR Microwave Office, HFSS, etc. We offer a Microwave Office (MWO) file on symmetric three-section coupler designs, which was used to generate the content on this page. Download the three section symmetric coupler design file for Microwave Office. The spreadsheets below supplement our calculator page, and in general offer data-crunching that is too complicated to put onto an HTML page for you. Here's the TRL calculator we promised you over on our TRL calibration page. Here are two presentations contributed by Wayne Struble on Normalized Determinate Function, the Cadillac of stability analyses. For more information, we offer a page on NDF here. There are two PDF files, make sure you grab them both. Here's a spreadsheet from our friends over at Texas Instruments that will help you estimate antenna range using the Friis-Equation and 2-Ray Ground Reflection Model. There's even a graphic included! Here is an Excel file that analyzes transient flow in one dimension. It's a big file, as it is performing numerical integration in two dimensions (distance and time). It is explained on our page on Fourier's Law. New for December 2015! Long ago a company called eeSOF came up with a standardized way to express S-parameters in a text file which is often referred to as a Touchstone® file. Keysight is now the copyright holder of the word Touchstone, when it is used in this context. They inherited it from Agilent, who inherited it from Hewlett Packard, who bought eeSOF way back in the 1990s. If you call the data an SNP file you don't have to worry about the copyright, right? Here is Microwaves101 page on SNP format. After downloading numerous MSExcel Spreadsheet calculators from MW101, I thought I might contribute one. It is an Excel Calculator for a Microstrip Rectangular Patch Antenna. I got the equations from an article by Professor Ben Horwath at Santa Clara U (titled Microstrip Patch Antenna Design Principles, just google it together with the author's name... UE). However, I added a little bonus. It also includes the ability to calculate the parameters over temperature if the user includes the temperature coefficients of expansion for the board material. 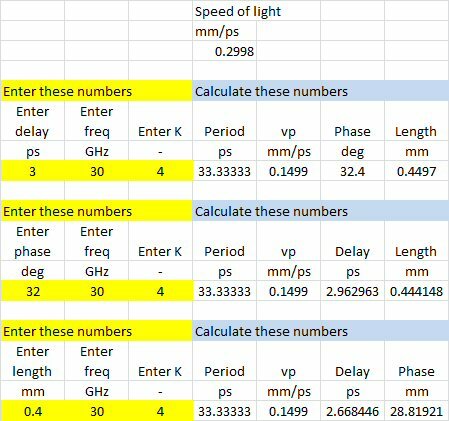 A lot of people ask us "why do you create spreadsheets for calculating stuff like group delay, when all these calculations and more are built into Keysight's ADS or AWR's Microwave Office software?" There are two reasons, Silly Rabbit: first, not everyone has spent $50K on software, but everyone has Excel. And second, you have a lot more options for presenting data using Excel. How many times have you sat through a design review where all of the plots were cut and pasted from EDA software tool simulations, and you can't identify what you're looking at or what any of the values are? We have two new downloads, one for calculating capacitance and one for calculating complex impedance from S-parameters. The capacitance calculator does the very simple job of calculating parallel plate capacitance, but it will save you the trouble of unit conversion and looking up the Dk of stuff like silicon nitride. While we were at it we included the capacitive reactance calculation at the frequency of your choice. Chris provided the calculator for converting magnitude and phase to impedances, which is a fundamental problem that belongs on any final exam in a microwave class (tell your boos that and ask him to derive it some time for fun). The impedance calculator download has caused a lot of trouble, which may or may not be related to the age of this web site (hopefully we will globally fix this problem and more during 2013...) The problem is that in most browsers, it is not possible to download a .xlsx file (the 2007 version or later of an Excel file) from a Cold Fusion page that was created in Dreamweaver 11.5 (in case you want to assign blame). The file that Chris sent us was the first Excel file that we have dealt with that could not be converted back to .xls due to some tricks he employed. Many people have tried unsuccessfully to download it, and a small number have written to us to complain and we have sent them the file by email. Now we offer the ultimate patch: we zipped it. Download it and and unzip. Sorry for the inconvenience! The Professor has donated his image rejection spreadsheet. Thanks! This file will help you understand the relationships between phase and amplitude imbalances, and overall image rejection, which is also explained on our Image Rejection page. Here's a spreadsheet that calculates characteristic impedance of a transmission line based on measure reflection coefficient. It's also explained on our DK and DF Extraction page. Here's a spreadsheet that performs via-hole inductance for microstrip circuits. It is improved for Rev 3 (July 2017)--please delete previous versions (the calculations were correct, but an equation graphic was incorrect). In the spreadsheet below, Chris answers an important attenuator question. What if you are building a pi attenuator from standard resistors and you're stuck with 1% values? This spreadsheet calculates exact attenuation and return loss from the inexact resistors, for 0.2 dB step size. Thanks, Chris! Here's a spreadsheet for looking at mixer spurs, contributed by Gerald. Thanks! You need to enable macros to get it to work. Also, it was originally intended for Europeans so decimals are separated by commas instead of points. Here's a companion page on how to use it. Here's a simple spur table calculator from Larry. If you keep reading down this page, we have at least one one other spur table download. Collect 'em all! Here's a spreadsheet that not only calculates the ideal values for lumped elements in a high-pass/low-pass phase shifter, it plots the frequency responses of the two filters and their relative phases over frequency! This is a good example of using ABCD parameters and complex math in a spreadsheet. This spreadsheet was tuned up during March 2016, now it does multi-bit calculations all at once, and the broken plot was fixed. Here's a link budget calculator from Andre. He supplies this spreadsheet to engineers considering point-to-point wireless connections. OK, this is practically a free advertisement for Adtran, so when you contact them, tell them you found them through this web site and that maybe they should cough up for a sponsorship or we'll remove the link budget calculator one of these days! Here's a freespace path loss calculator contributed by Robert! It is something he put together for coworkers so they could understand Wi-Fi a little better. It allows you to customize the general RF situation in the environment (allowing you to match real world better to estimations). It also allows you to select different frequency ranges. This is an Excel 2007 file, software which we don't have, so we have yet to try it! If anyone has any comments of suggestions we will relay them to Robert. Note that the file is zipped, we had to do this because most web browsers won't know what to do with an "xlsx" file! Here a spreadsheet for analyzing even and odd mode impedances of coupled-line couplers. Here's a "reverse microstrip calculator" a spreadsheet that lets you specify impedance and solves for line width. It uses linear interpolation, and is explained on this page. If you think the attached worthy, please accept it gratis for use as a YAOD (Yet-Another-Oddball-Download). Here's a spreadsheet from Chip that simulates the Klopfenstein taper. We made it more usable, with 21 impedance steps. We're working on an explanation on this page. Thanks to David, the spreadsheet below now has a correction to the math which was published by Kajfez and Prewitt in 1973. David also made other improvements to make the spreadsheet more usable. Thanks again! Here's our version of a poor man's CAD tool for doing layouts (like Visio, or a really cheap version of AutoCAD). It's all explained on our FraudoCad page. This Excel spreadsheet calculates free space loss and and Fresnel zone radii. Inputs are frequency in GHz, transmitter TPO, antenna gain, transmission line loss, path distance, RX threshold, and obstruction distance for the Fresnel radius. Outputs are freespace loss in dBm, RX signal in dBm, RX fade margin, 1st, 2nd, 3rd and 4th Fresnel zone radii at the obstruction (calc) point. We've finally got around to dressing up our VSWR spreadsheet into something we're proud of! After a couple of iterations, we're now at Rev 4.0, so if you have an older version, now would be a good time to update! We fixed the math, and added a slider bar so you can animate the waveforms. Note: you have to enable macros in order to get this spreadsheet to work! This spreadsheet has its own page of instructions located here. Here's a spreadsheet that shows you how to do linear interpolation in Excel, a valuable skill in any engineering field. Here's a page that describes this calculation. Everybody knows that you can produce a graph and add a polyline to it. But do you know, that you also can calculate the coefficients for a polynomial in Excel from a set of data and use them in your spreadsheet directly? You also can display the function of this polyline in the graph. You can copy and paste this formula into a cell for further use in the spreadsheet. It works, but you have only the accuracy as displayed in the graph and it is a lot of work. I did that until a coworker came up and said there is a simpler way to do it without creating a graph and the copy and paste work. This function is very well hidden in Excel and not easy to find. I created an example spreadsheet to show how it works. Up to which order of polynomial it works, I have not tried out yet. The benefit of this function is, that you have the full accuracy of Excel for each coefficient, this is especially important for higher orders of polynomials. The Excel Version I have is Excel 2003, the conditional sum wizard needs to be installed. We have a new page that offers some free downloads courtesy of the U.S. Navy! The Navy Electricity and Electronics Training Series (NEETS) was written as part of the non-resident training course series and released to the public in 1998. We've only posted the topics that have to do with microwaves, radar and radio, but if there's enough interest we might upload the entire set. You can find these training manuals on many other web sites, but few have the bandwidth that we have for rapid downloads. Some lesser web sites even try to sell them! Thanks to Steve for suggesting this idea! The previous version was missing a couple of curves. We've created a bare-bones Smith Chart using equations for circles inside an Excel file. Then we stripped away the equations and left just the data. You can use this file any way you like, to plot data on the Smith Chart inside Excel. We'll be using it on some future spreadsheets, you betcha. Here's Kire's level diagram spreadsheet. Kire is one of our best "answerers" on the Microwaves101 message board, he's a prime example of what makes this a great web site. Here’s a calculator that I made for quickly making miters in AutoCAD. Your's, like all other ones I’ve seen reference the same A, X, and D dimensions. However, to draw a miter in AutoCAD with these dimensions can get tedious with the keystroke entry of perpendiculars, offsets, and trim commands, etc. and then have to repeat it on an assembly with many bends. With this calculator, you enter the bend angle and it will calculate the distance for you to enter when you invoke the CHAMFER command in AutoCAD. This will quickly let you put the optimum miter on any arbitrary angle from 0 to 90 degrees and you can just click-click-click your way through any bend. The table below the calculator just takes the equation and fills in a variety of widths and angles. Pardon the minimal graphics, I made this not as a full self-explanatory file, but just something simple to give our CAD guys to speed up their work. Feel free to use or modify any of it, but this only works for AutoCAD. Other tools use a different method for calculating miters. Here's a spreadsheet that analyzes coupled-line couplers. You can vary the coupling factor, then see what an ideal coupler does over frequency. Be sure to turn on Excel's Analysis Toolpak! Here's a spreadsheet that will help you floorplan a power amplifier! It is described on this page. Here's the start of a spreadsheet that looks at the array factor for phased array antenna calculations. Well, OK, it only looks at a single line of antennas (from 1 to 101), it would be too big to download if it simulated an entire array in two dimensions. It is far from finished, but maybe some smart person out there can take over for us and put some more effort into it. It is useful for looking at the various tradeoffs of gain versus number of elements, grating lobes as a function of element spacing, number of phase shifter bits, type of phase shifter, and a few other things. Feedback is appreciated! For January 2016, our waveguide loss spreadsheet has been improved in several ways. 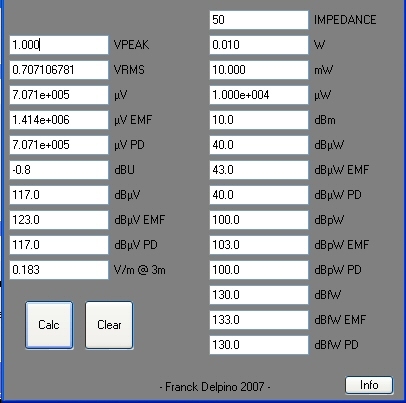 We added standard rectangular waveguide all the way to WR0.51 (for teraHertz frequencies), thanks to "Uli's list" which you can find on our rectangular waveguide dimensions page. All the low frequency guides are still in the spreadsheet of course, and you can even make custom cross-sections. We made it much simpler to generate your own comparison plots, the plot starts with ten different species of guide but you can add or delete lines as required. You can easily toggle between dB/cm and dB/m on the comparison plot, and compare the effects of using different metals on loss. Enjoy the improved file and make custom versions of the plot below! Here's a table that is more complete than the other one we had on our waveguide dimensions page. It was contributed by Alan D. from NZ. It has the three primary official designations along with some commercial designations, and interior dimensions are given in millimeters and inches. Here's two contributions from Spinner GmbH, on waveguide cross sections (including ordinary, reduced height, circular and double-ridged) and waveguide flange dimensions, both in pdf documents. These are the most comprehensive lists we have seen so far. Thanks! Updated April 2019: Simone and Uli have sent in updated lists. As always, thanks to both of you! 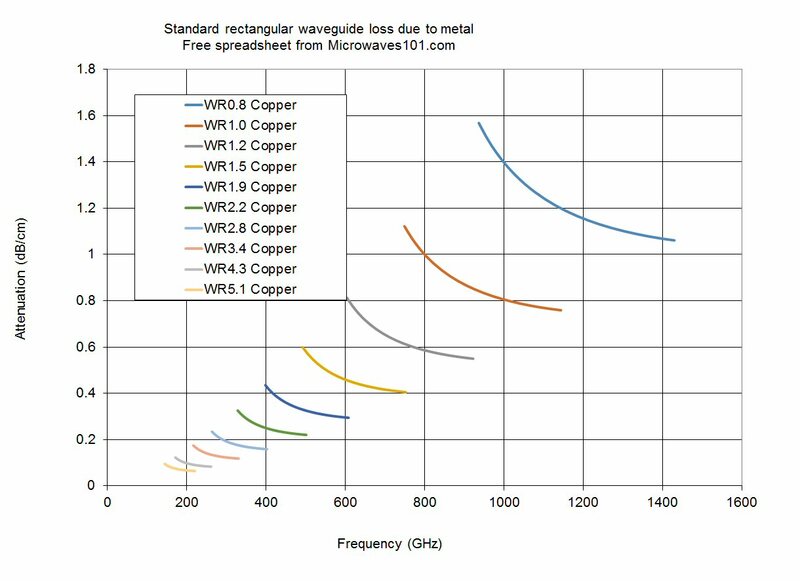 Our spreadsheet performs the exact calculation of metal losses of coax with frequency (splitting out the calculations for center and outer conductors). It also computes dielectric losses due to loss tangent and dielectric conductivity and a ton of other parameters like characteristic impedance, capacitance and inductance per unit length, cutoff frequency, etc. The spreadsheet handles the offset coax calculation. See why our spreadsheet is a ton more useful than Keysight's ADS or AWR's Microwave Office for analyzing coax! Here's a multi-dielectric coax calculator, contributed by Alex R. We recently corrected a problem with the cut-off frequency calculation for single dielectric, which was pointed out by Andrew (thanks!) It will calculate characteristic impedance of coax that contains up to five concentric dielectrics! Be sure to check out our page that explains the math. Here's a filter calculator from Vlad, which does lumped element calculations (Chebyshev and Butterworth) and is very cool and admittedly better than the Excel calculator that we offer farther down the page. We now have a page that describes how to operate Vlad's calculator (but it's so simple you could figure most of it out yourself). We've had a lot of positive feedback about this calculator. The latest version offers the uses control over the plot axes. Please send us your comments on this calculator, Vlad volunteers to fix any problems you have! Here's a MATLAB (c) tool for cylindrical resonant cavities. Contributed by Itzik! Our S-parameter Utilities spreadsheet is the ultimate tool for manipulating S-parameters into all manner of plots, including group delay, K-factor, maximum available gain, VSWR, mismatch loss, loss factor, and input and output impedance plots. You can now quickly plot all of these parameters, from any manufacturers' S-parameters that you can download! We recently added the ability to calculate length of a transmission line (if Keffective is known), or velocity factor and Keffective if length is known. The spreadsheet has the ability to import data in real/imaginary format (in addition to magnitude or dB). It provides reference plane extension capability, and averaging to the group delay, VF, Keffective and length calculation, and even does Smith chart plots! We recently fixed a bug in the GMAX calculation which fixes a problem where the 15 digits of precision within Excel sometimes aren't enough! (Explanation of this statement can be found here.) The spreadsheet can handle 2001 lines of data, if you want a smaller file it's up to you to truncate it. The latest version includes the Stability Measure B1, thanks to Kelvin. B1 must be greater than zero to ensure stability. 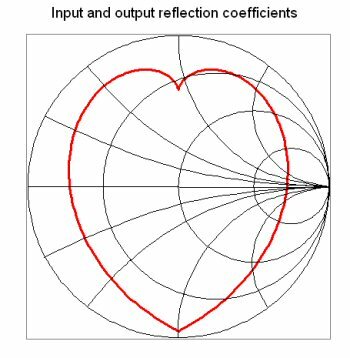 Back in 2006 we created the heart-shaped S-parameters file and offered it in a spreadsheet download. We all know how SNP files sometimes don't work, so we updated the file slightly and it has been verified to work in Microwave Office. We added a second smaller heart while we were at it. 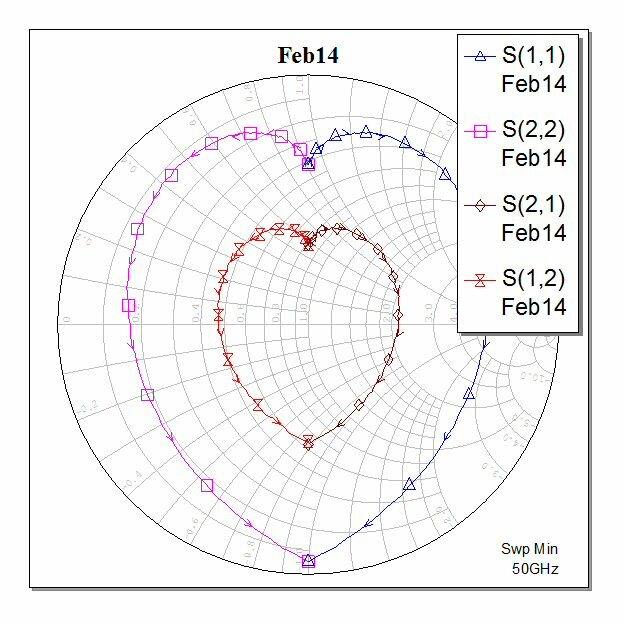 Just tell your Valentine to plot all four S-parameters on a Smith Chart, and he/she will get the image below (plotted in MWO). We had to zip the file, otherwise it won't go through the download chute (it doesn't like the .S2P extension). If you prefer, here's our S-parameter utility spreadsheet with the "heart curve" built in so you don't have to load the S-parameters into Excel. If you're lazy, just grab the graphic below and toss it into a steamy email! Here are the equations that we used to generate this graphic, we adapted them from something we found on the worldwide web. Here's a download for looking at mixer waveforms. We have a new mixer waveform page that will show you how to use this to understand how a mixer works, in the time domain. Originally Chris and Graham from across the pond have sent us a cool spreadsheet for calculating mixer spurious products! It's as good as the one at Hittite.com, but because you download it before you use it, no one will ever know your secret frequencies! The Microwaves101 Professor has outdone them with an expanded mixer spur calculator which you can now download. We have also put up a page on the instructions for using the revised calculator, check it out! Here's one engineer's collection of aerospace slang, it's from Carl F. Gauze who works at Anonymous Aerospace. (Danger Will Robinson, this document contains the F-word, so don't download it if you have a problem with that!) Click here to go to the Microwaves101 slang dictionary. Here is our lumped-element Chebyshev filter calculator! It now includes plotting capability, so you can synthesize filters and play with them in real time! (We are still working some bugs, be sure to look over the "readme" page.) Using this Excel spreadsheet you can calculate ideal elements for N=3, N=4 and N=5 order low-pass, high-pass, and band-pass filters, and you get to specify the passband and the ripple. A full description is given on our section on lumped-element filters. This SPICE skin effect cable attenuation model was contributed by Mike Leung of Northrop Grumman Space Technologies (formally TRW). This is for engineers who model circuits using SPICE, which unfortunately excludes everybody at Microwaves101! But it looks cool so we will pass it along! Here's a spreadsheet for calculating N-section impedance transformers, to match two real impedances that you specify! The "bug" is fixed, you can now transform in both directions (Z1<Z2, Z1>Z2). In July, the Professor redid the calculator (again! ), it now calculates equal-ripple, maximally flat and exponential transformers (up to eight sections). It even displays the frequency response, you don't need ADS or Eagleware or other expensive software! Note: If your Excel software doesn't have the "Analysis ToolPak" installed , you might not be able to view the graphs properly. Go to "tools", then "Add-Ins", then check the box for "analysis ToolPak". Check out our page on quarterwave tricks for more information on transformers. Download The Professor's N-section impedance transformer spreadsheet. Our RF sheet resistance spreadsheet calculates the equivalent ohms per square versus frequency for up to three layers of different metals, using the skin depth equation and a little calculus that we already solved so you won't have to tax your tired brain! This is a feature you won't find on Keysight's ADS software. It also has a single-metalization option that plots resistivity and conductivity for 1, 2, 3, 4 or 5 skin depths (per request of Chris G.) The spreadsheet is totally unlocked, and features a pull-down menu of metal parameters for your convenience. Try out our on-line skin-depth calculator for quick analyses! Cascade101.xls - the best cascade analysis spreadsheet you'll ever get for free. For more information about this and other cascade analysis tools, check out our Cascade Analysis page. Send us an email if you want a cascade tool with more capability! Here's an air-bridge inductance calculator in Excel, contributed by Matt. The math appears on this page. Note that Matt changed the units to more-relevant picoHenries. Thanks! How many times have you had to convert electrical degrees to length or delay? Here's a simple spreadsheet that does the calculation three ways. If you are designing a time delay unit, you know what we are talking about... while you are thinking about this, commit the following to memory so you can do the calculation in your head: 300 mm (~one foot) is one nanosecond delay in free space, and is one wavelength (360 degrees) at 1 GHz. Our friend Aakash has been working on Smith charts, and thoughtfully sent us some MATLab code to generate a 3D Smith chart and compute some basic functions. He's also included a presentation he made about Smith charts in the following handy zip file. Here's a couple of Visio files that contain graphics for coax and waveguide schematics of block diagrams. These were supplied by Ted! Thanks! What would a microwave web site be without some handy Smith chart downloads? Here are some great Smith charts that are low in megabytes but high in resolution, perfect for documents! Here's a Microsoft Word document that contains schematic symbols such as resistors, capacitors, circulators, attenuators and switches, power dividers, bias tees, DC blocks and assorted other microwave components. In the latest edition (July 2011), we've added a symbol for a ferrite bead, per William's request. You can use this file to create your own schematics for documents and presentations. Please send your feedback on this work-in-progress to techwriter@microwaves101.com. Check out Varian's "History of Radar" ads, those cats were real gone! Here's a poster for your lab in PDF format. Print it and post it and help us Fite Microwave Stupidity! Here is a poster on the topic of Women in Microwaves, that was prepared by Dr. S. Raghavan and Prof. S. Suganthi. Check out NITT's Microwaves101 page for more information on microwave education in India. At Microwaves101 we pride ourselves on building microwave information into our encyclopedia, so it is indexed, cross-linked, and totally convenient. Not like some crummy pdf data sheets and app notes that suppliers put up for you to go crazy waiting two minutes to download so you can spend ten minutes looking for and probably not finding the info you need. We also make it a point not to steal stuff from other web sites and offer it as our own. Thanks to Rob, we now offer Microwaves101 Hall-of-Famers Matthaei, Young and Jones "Microwave Filters, Impedance Matching Networks and Coupling Structures" which dates back to 1963 but is still the most complete book on microwave filters ever written, at 1,000 pages. This material was developed under government contract and hence is approved for public release by DTIC (which is where we found it). Here is a list of microwave laminates, prepared by SPC. You'll find it invaluable. Thanks to Alicia! By the way, if you ask SPC nicely, they might even send you a laminated 11 x 17 inch poster free of charge. Look on their web site for details. Download the Microwave Laminates chart! Here's a booklet titled "How to Treat Women in the Workplace". It was written for Hughes Aircraft employees in the 1950s, and it would not represent an acceptable company policy today. If you want to be horrified at "the way we were", check this out! Thanks to Chris, we now offer a copy of an 1954 NRL report dating from 1954, on the design and calibration of horn antennas. NRL Report 4433 DESIGN AND CALIBRATION OF MICROWAVE ANTENNA GAIN STANDARDS, by William T. Slayton, gives dimensions for construction of a series of microwave horns of known gain, and may be used as a calibration reference. The horns are designed to match up well to standard waveguide sizes. Virtually all standard gain horns on the market follow the dimensions called out in this report. We found the document at the Defense Technical Information Center, specifically here. So we'll assume it is public domain, and offer it through the link below. Enjoy! We have much more on material on William Slayton thanks to his daughter Charlotte! Here is a much better copy of the NRL report. Here is an article he wrote for Electronics Magazine in 1955, on the same topic! Finally, here is a speech he gave in 1980 about his experience at NRL, three years after his 1977 retirement. It's no wonder that William Slayton is in the Microwave Hall of Fame! The Quadrennial Defense Review report is put together every four years by the Department of Defense, the latest was issued February 2014. This report defines where we are on the war on terror, as well as the to-be state. If you want to win a government defense contract you should read this and reference it in your proposal. Here's the previous QDR report in case you want to see what changed. The US Department of Homeland Security also issued a quadrennial review report in February 2010. DARPA has a strategic plan, you should read it! The Navy released some great tutorial documents in 1998, including an entire series on electronics. We've posted the NEETS documents on a separate page.